Pharmacogenetic Testing: Why Is It So Disappointing? Psychopharmacology, the practice of using medications to treat psychiatric disorders, has been hamstrung by trial and error in finding an effective means of treating without discouraging adverse effects. Indeed, there is widespread variability in the effects of all psychotropic medications as well as adverse effects that interfere with adherence to the dosing regimen (Turner, 2013). In 2005, the U.S. Food and Drug Administration approved pharmacogenetic testing (Squassina et al., 2010), and private companies began marketing this testing to mental health professionals as a way to personalize prescribing and reduce the trial and error process of determining what medications would work best for each client. The current article focuses on a brief review of genetic terminology and pharmacokinetics (specifically the cytochrome p 450 [CYP450] system), detailed discussion of the benefits and limitations of current pharmacogenomic testing, and recommendations for clinicians. Genetics refers to the heritability of specific illnesses with a focus on single gene function and composition. Initially, psychiatric researchers sought to find the extent any one psychiatric disorder could be inherited (e.g., bipolar disorder among the Amish [Egeland, 1988]), but this was a frustrating search due to the multifactorial nature of mental disorders. Research shifted to genomics, the study of the complete set of DNA including all genes and their effects on one another (Kadakkuzha & Puthanveettil, 2013). Epigenetics refers to the changes in an organism by gene expression rather than the genetic code and involves environmental influences as well as internal mechanisms. It is through gene expression that DNA is transcribed into an exact RNA copy (Ozomaro, Wahlestedt, & Nemeroff, 2013). When there is shifting in parts of the gene during this copying process, there is a change in the organism. Inheritability of mental disorders was replaced by a search for biomarkers for disease that uses specific laboratory tests and imaging to find distinctive evidence of neurophysiological changes that lead to symptoms (Dean, 2019; Ozomaro et al., 2013). Finally, pharmacogenomics seeks to describe how genes affect an individual's specific response to drugs, usually by means of the pharmacokinetics of the drug (Gross & Daniel, 2018). Pharmacokinetics is the study of how the body affects a drug, that is the metabolism, absorption, duration of action, distribution throughout the body, and excretion (Venes, 2013). The metabolism of a drug is predominantly by the liver through the CYP450 system of enzymes and conjugation. Pharmacogenomic tests primarily identify changes in genes that express specific enzymes in the CYP450 system, thereby altering how an individual metabolizes drugs that affect that enzyme. There are 18 families of CYP450 genes; however, only a few play a role in the metabolism of psychotropic medications (Table 1). The specific family of genes may serve as a substrate (i.e., metabolizes), inducer (i.e., hastens the metabolism), or inhibitor (i.e., blocks the metabolism) for a drug or food (DeVane, 2017). Genetic polymorphism or mutations in a genotype can occur that affect the effectiveness of the CYP450 system, resulting in slow metabolizers, rapid metabolizers, or ultra-rapid metabolizers (Venes, 2013), thereby contributing to highly variable responses to medications as well as side effects. Extensive metabolizers are those who have normal metabolism by the particular enzyme. For example, if an individual has a polymorphism of CYP2D6 resulting in unavailability or reduced availability of the enzyme, he would not be able to break down drugs that use that enzyme as a substrate and would respond slowly or not at all to the drug and have increased side effects. Similarly, if the polymorphism resulted in increased activity of 2D6, the individual would be a rapid metabolizer and require higher dosages of a drug that is metabolized by 2D6. Approximately 1% of the population are poor metabolizers and polymorphisms are familial as well as ethnically determined (Gross & Daniel, 2018; Venes, 2013); therefore, genomic testing can help in identifying variations in an individual's CYP450 system and predict responsiveness to drugs. Current pharmacogenomic testing has become less expensive and provides the clinician clinical evidence in selecting medications for individual clients. These tests have reduced the trial and error in prescribing and deducing how clients might respond based on family history and previous responses to medications. 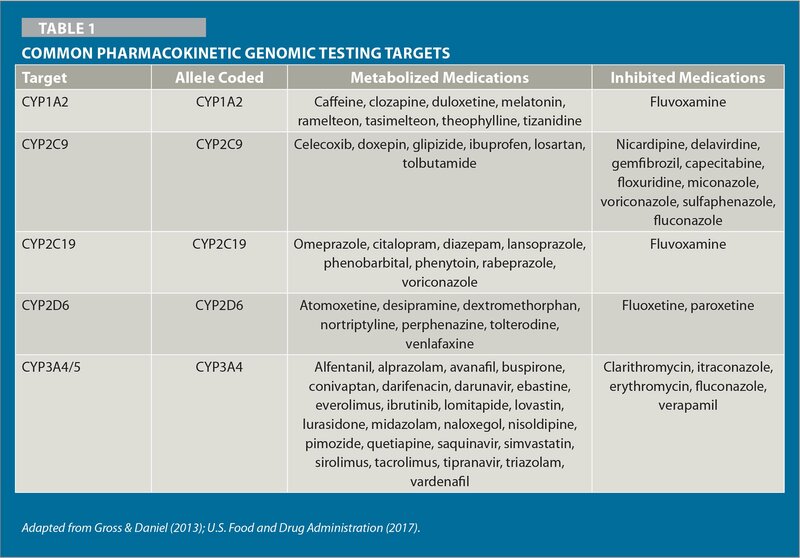 In vulnerable populations, such as children and older adults, pharmacogenomic testing can reduce polypharmacy, inadequate drug trials due to side effects, and drug–drug interactions. Because most psychotropic drugs require prolonged use before achieving therapeutic response, treatment can be delayed significantly due to trial and error, and pharmacogenomic testing can potentially lessen that delay (Bray, Clarke, Brennan, & Muncey, 2008; Turner, 2013). Many private companies market pharmacogenomic testing, which has contributed to the decreasing costs of the tests. Results from the test are not going to change; therefore, it is a onetime only expense, assuming the client maintains the record. The greatest variation in companies comes from the methods for DNA testing as well as the manner in which the reports interpret the results. Conducting the DNA testing is relatively simple and noninvasive, as the sample is usually collected via saliva sample or buccal swab. Depending on the laboratory, results are usually available within 1 or 2 weeks. Advance practice RNs need skills in understanding the results to apply them in prescribing as well as explaining them to the client (Brennan, 2015). There are different targets for pharmacogenomic testing. Most common are the pharmacokinetic targets of the CYP450 system; however, these focus only on the metabolism of drugs. In addition, polymorphisms occur in genes that affect the pharmacodynamic properties of drugs including neurotransporters and neuroreceptors; however, these targets usually are not included in the genetic test results (Table 2). Therefore, the full spectrum of how effective a medication will be for a specific client is not yet available by pharmacogenomic tests. Identifying biomarkers of psychiatric disorders is still in its infancy. Yet, these biomarkers and the genetic variations are what drives the symptomatology that clients manifest. Pharmacogenomic testing does not provide information about biomarkers; therefore, it cannot guide the clinician in prescribing to improve symptoms. Much of the research on pharmacogenomics is industry sponsored without supportive independent study. Similarly, the specific test results are generated and interpreted by the industry that profits from the outcomes, which raises ethical questions about the costs justifying the effect on patient outcomes (Redinger, Gibb, & Westerman, 2017). Private insurance companies cover part or all costs if the clinician seeks prior authorization as medically necessary (Bose-Brill, Xing, Barnette, & Hanks, 2017). Medicare has no national policy for testing; coverage varies from state to state (Cohen, 2012; Weitzel et al., 2014). Because the results focus on the metabolism of drugs, testing limits the use of predicting how effective the medication will be with the client's particular neuropathology. How do clinicians decide if and when to offer pharmacogenomic testing to clients? There are yet to be clinical guidelines for making this decision; however, the following suggestions might help clinicians. Carefully review with the client past responses to medication trials, including side effects and length of time for response. This history provides information regarding fast and slow metabolism in relation to the CYP450 enzymes metabolizing those medications. Inquire about family history of response to particular medications as the client may have similar responses. Fully describe the benefits and limitations of pharmacogenomic testing, including cost and third-party reimbursement, to the client. Review several psychopharmacogenomic testing companies, including what polymorphisms they test, how they report and interpret the results, what the report to the clinician and client look like in terms of clarity and specificity, the costs and reimbursement, and availability to the clinician of expert consultation regarding the results. For vulnerable clients (e.g., children, older adults, clients with complex medical problems), consider pharmacogenomic testing early in prescribing rather than rely on trial and error. Psychiatric disorders are complex in that diagnostic labels do not correlate with neuropathology, and it is the genetic neuropathological variations that genomic testing seek to describe. How an individual reacts to both the disorder and medications to treat the disorder relies on neurotransporter and neuroreceptor functions that are currently the target of research in specific psychiatric illnesses such as schizophrenia, bipolar disorder, attention-deficit disorder, and anxiety disorder (Ozomaro et al., 2013). This area of science is still developing, making truly personalized prescribing in psychiatric– mental health nursing more a promise than a reality. 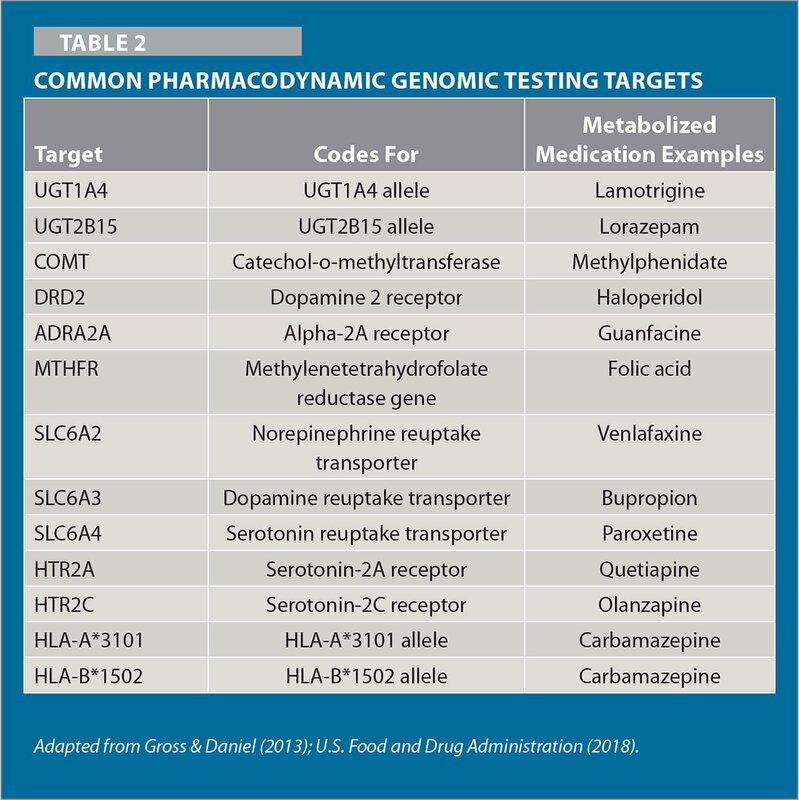 Private companies have widely marketed pharmacogenomic testing to psychiatric–mental health prescribers as a way to personalize prescribing; however, the test results focus only on the pharmacokinetic elements and less on the pharmacodynamic elements. Therefore, the results can be somewhat underwhelming and disappointing to psychiatric–mental health nurses (PMHNs) who are trying to provide safe and effective care to individual clients. The cost of testing remains prohibitive if not covered by third-party payers and asking the client to pay out of pocket when the results may provide little guidance to making decisions raises ethical questions for clinicians. The burden is on PMHNs to be fully informed about improvements in psychopharmacological practice and change their practice based on current knowledge. Venes, D. (2013). Taber's cyclopedic medical dictionary. Philadelphia, PA: F.A. Davis. Dr. Limandri is Professor Emerita, Linfield College, School of Nursing, McMinnville, Oregon. Address correspondence to Barbara J. Limandri, PhD, PMHNP, BC, Professor Emerita, 9136 SW 36th Avenue, Portland, OR 97219; e-mail: limandribj@gmail.com.